You can contact me via Skype or iChat. All you need is a broadband connection and a webcam. I am now able to offer one-to-one Japanese lessons over the internet via Skype or iChat video links. If you’re interested, read on. To take part in online classes, you need a computer with a camera and microphone, and a broadband internet connection. 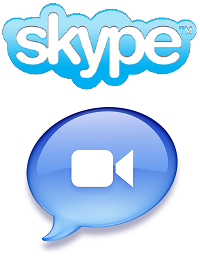 You can download Skype software for free at skype.com. Or if you’re running Mac OS X, then you most likely already have iChat installed on your computer. If you’re interested, please fill in the application form, but don’t forget to indicate that you’re interested in online lessons.